Home>Blog>Cities Across the Country are Applying a Racial Equity Lens to Their Parks! Cities Across the Country are Applying a Racial Equity Lens to Their Parks! Originally published by NRPA, in partnership with GARE on February 6, 2018, Department, by Alec Weis, Julie Nelson, Jennifer Ringold, Art Hendricks and Jules Posadas. To read the original article, click here. Many park departments hold inclusivity as a core value and take a non-exclusionary approach to park services. While inclusivity is an important principle, this broad approach fails to acknowledge the discrepancies in how resources are allocated. Restructuring resource allocation on an institutional level can work to combat deep racial inequities. Racial inequity in the United States affects every success indicator. Working toward racial equity involves closing this gap and improving outcomes for everyone. Parks are particularly poised to effectuate equity in neighborhood development, health outcomes and education. Achieving a more equitable society requires being intentional in applying specific strategies to eliminate the gaps and lift outcomes for all groups. These changes require more than just ensuring that services meet the needs of the community. Instead, they must focus on changing policies, institutions and structures. Seattle, Portland and Minneapolis are all exemplary park departments that have successfully shifted their approach from mere inclusivity to racial equity. The City of Seattle Race and Social Justice Initiative (RSJI) established a vision for racial equity, and park and recreation programs and facilities are bringing that vision to life. Seattle Park and Recreation’s programs, policies and initiatives are embedded with racial equity outcomes, strategies and actions to provide measurable results to strengthen healthy people, the healthy environment and strong communities. To achieve this vision, Seattle has separated the process into three distinct phases: assessment, development, and implementation and improvement. During the initial assessment, the RSJI Change Team has helped to determine the regions where resources can be intentionally allocated most effectively. Jules Posadas, a leader of the Parks RSJI Change Team, emphasizes the importance of using a “stakeholder-driven process.” By partnering with organizations embedded within the community, it is possible to determine community needs and priorities. For instance, in establishing the “Get Moving Fund,” a clear correlation emerged between race, poverty and obesity. By identifying this correlation, the city’s finite resources could be deployed to best serve the vulnerable parts of the community with the highest disparities. Having a plan ensures that there are measurable results, divisions are accountable and staff is intentional in implementing the work, both from the top down and the bottom up. The superintendent supports the plan and provides clear directives to the staff, which is involved in the implementation and embeds racial equity goals on the ground. There are real measurable metrics to assess the effectiveness of racial equity within programs. Lastly, Seattle RSJI has deployed a specific assessment project developed by the overall RSJI, with the purpose of improving capacity to achieve racial equity and track the effectiveness of using racial equity tools. It creates an opportunity for reflection around goals and strategies, while providing important metrics for future initiatives. The Minneapolis Parks and Recreation Board (MPRB) has been developing its approach to racial equity, inclusion and diversity over the past decade. Its Racial Equity Action Plan, designed to be updated on a regular basis, establishes timelines, accountability and performance measures for each action. Those actions include the MPRB’s unique approach to ensuring capital improvements do not reinforce current racial disparities in the city by directing funding where needs are greatest. In December of 2016, the MPRB adopted its annual budget, which, for the first time, utilized an empirical equity matrix to select capital improvement projects in neighborhood parks. In 2017, the MPRB expanded on this work by introducing a second matrix for selecting nature-based regional parks improvement projects and an additional equity framework for allocating recreation staff funding to each of its 47 recreation centers across the city. In addition, the MPRB’s budget process requires that each new request or potential budget cut be viewed through an equity lens. In Minneapolis, parks are within a 10- to 15-minute walk from every home and are a visible and influential part of the environment. Deputy Superintendent Jennifer Ringold recognizes that due to the high visibility of parks, community members and staff can quickly see the impact of their work. It can sometimes take a long time to see results of racial equity work; however, parks provide an excellent incubator to see that impact. The plan uses a data-driven equity framework to operate with urgency and accountability. 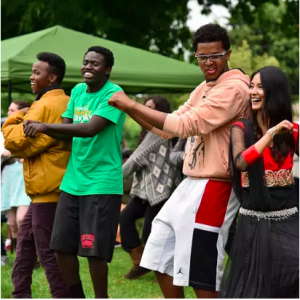 Portland has established the Parks Race and Ethnicity Project (PREP) that collects accurate information concerning communities of color, immigrants and refugees and has served as an integral assessment tool. PREP was created to better understand who is currently using the PPR services provided at community centers. By understanding this information, the bureau is better able to assess its performance in serving all populations. Hendricks says, “Parks bring communities together and help to break down social, racial and cultural barriers.” Park programs can be used to engage the most marginalized communities to create civic community engagement. By dismantling social isolation, Portland parks help to eliminate institutional racism. Programs such as the Youth Ambassador Program has hired high school- and college-aged youth from more than 10 different ethnic groups to work within their community. Portland has also partnered with organizations of color to train arborists within urban forestry. By laying out a clear racial equity action plan, park departments can focus on achievable strategic goals and make critical progress toward a fairer and more just society for everyone. We are organizing in government with the belief that its transformation is essential for us to advance racial equity and is critical to our success as a nation. Park and recreation agencies are situated within communities where people live, work and play and, as such, can play a key role in advancing racial equity. Alec Weiss is a Research Assistant from the University of California, Berkeley, for the Government Alliance on Race and Equity. Julie Nelson is Senior Vice President, Race Forward/Center for Social Inclusion and Director, Government Alliance on Race and Equity. Jennifer Ringold is the Deputy Superintendent for the Minneapolis Park and Recreation Board. Art Hendricks is the Equity & Inclusion Manager for the Equity & Inclusion Office, Portland Parks & Recreation. Jules Posadas is Race and Social Justice Initiative Co-Lead, City of Seattle Parks and Recreation.